Also serving communities of Riceville. There are 7 Assisted Living Facilities in the Athens area, with 4 in Athens and 3 nearby. The average cost of assisted living in Athens is $3,137 per month. This is lower than the national median of $3,346. To help you with your search, browse the 28 reviews below for assisted living facilities in Athens. On average, consumers rate assisted living in Athens 4.7 out of 5 stars. Better rated regions include Dayton with an average rating of 5.0 out of 5 stars. Caring.com has helped thousands of families find high-quality senior care. To speak with one of our Family Advisors about assisted living options and costs in Athens, call (855) 863-8283. April Move-In Special! No Community Fee when you move in by April 30th. Athens, Tennessee, is a small town along Interstate 75, approximately an hour northeast of Chattanooga and just to the east of the Nantahala National Forest. It is home to the Gardens of Sunshine Hollow, which provides a year-round bakery, craft shows and walking trails among the flowers for seniors to enjoy. For seniors who require help with daily living tasks, there are four assisted care living facilities within the town limits and three nearby. 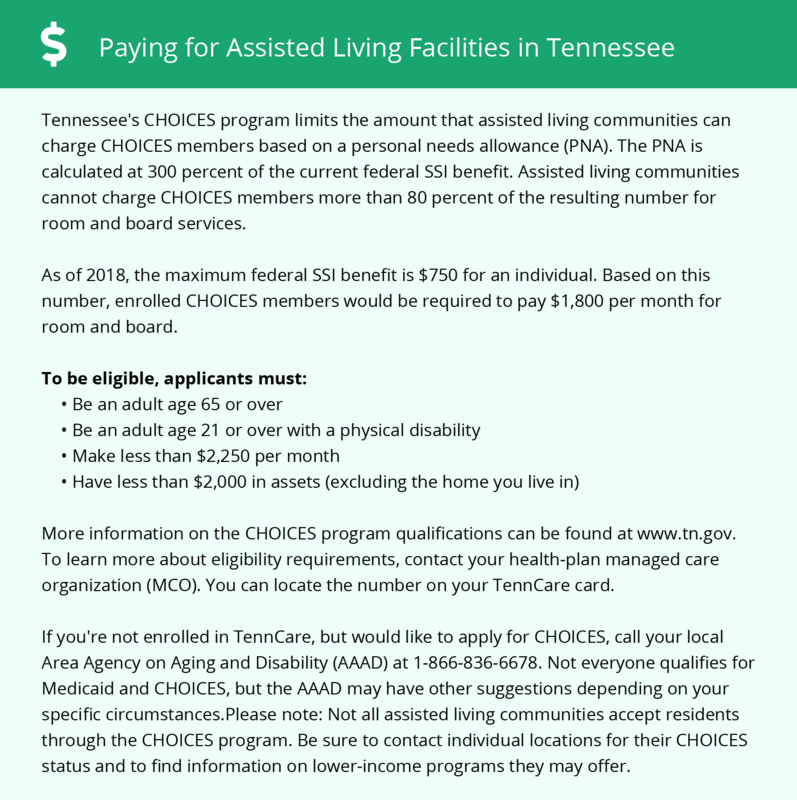 Assisted care living facilities in Tennessee are regulated by the Department of Health Board for Licensing Health Care Facilities. They offer services like room and board, medication administration, grooming and meals. Athens has an array of community resources for seniors, including the McMinn County Senior Citizens, Inc., an organization that provides support programs and holds special events for seniors in the area, as well as one senior center. The Athens area is home to world-class medical facilities, including Starr Regional Medical Center, in the event of medical emergencies or illness. The McMinn Senior Activity Center provides day trips to various locations throughout Athens for seniors. The East Tennessee Human Resources Agency also offers scheduled rides to doctor's appointments, shopping and for other errands. Seniors will have no problems holding on to their dollars in Athens. Based on the national average of 100, the cost of living in Athens, Tennessee is 84. This is also lower than the states' average of 96. Crime may be a concern for seniors in Athens, which ranks 91.1 for violent crime, which is much worse than the national average of 31.1, and 84.4 for property crime compared to the national average of 38.1. For seniors who enjoy getting outdoors, Athens' summers are warm with highs around 88 in July. It can get cold in the winter, with lows in January around 27. The town gets around four inches of snow per year and 55 inches of rain. Assisted Living costs in Athens start around $3,137 per month on average, while the nationwide average cost of assisted living is $4,000 per month, according to the latest figures from Genworth’s Cost of Care Survey. It’s important to note that assisted living rates in Athens and the surrounding suburbs can vary widely based on factors such as location, the level of care needed, apartment size and the types of amenities offered at each community. Public financing is available for assisted care living facilities in Athens through the state’s Medicaid CHOICES program. The amount covered is 80 percent of the maximum personal needs allowance. CHOICES set the personal needs allowance at 300 percent of the Federal Supplemental Security Income rate. Family supplementation is permitted in order to pay for a private room. Athens and the surrounding area are home to numerous government agencies and non-profit organizations offering help for seniors searching for or currently residing in an assisted living community. These organizations can also provide assistance in a number of other eldercare services such as geriatric care management, elder law advice, estate planning, finding home care and health and wellness programs. To see a list of free assisted living resources in Athens, please visit our Assisted Living in Tennessee page. Athens-area assisted living communities must adhere to the comprehensive set of state laws and regulations that all assisted living communities in Tennessee are required to follow. Visit our Assisted Living in Tennessee page for more information about these laws.